Reg Athwal started his first business at the age of 17. He then had to face bankruptcy at aged 21, but turned his life around to make his first US1$million dollars at the age of 26, going on further to build a US$20million company from an initial US$14,000 investment. Since then he has built numerous start-up companies in UK, Dubai and Bahrain and worked with over 10,500 CEOs and 150,000 managers in 36 countries. Reg Athwal has spent many years building businesses and specializing in human capital management and human potential development, and combines these two areas to be masterful when presenting on the platform, whilst informing and educating audiences throughout their conference experience. What you get with Reg Athwal is a warming and energetic professional delivery style, backed with extensive business expertise and substance. Reg Athwal is an expert link presenter, moderator, facilitator of panel discussions and forums, and master of ceremonies for prominent gatherings to include Awards Ceremonies, Product Launches, Government Forums, Royal Family Addresses and Celebrity Functions. One of his key achievements includes being the opening Keynote Speaker and Chairman of the first congress and official opening of the Emirates Palace in Abu Dhabi, UAE. He is the best-selling co-author of the 'RAW Questions' book-journal series and USA bestseller 'Wake Up and Live the Life You Love'. His fourth book 'Unleash Your DNA – Achieve Remarkable Results Fast!' was published in 2009. 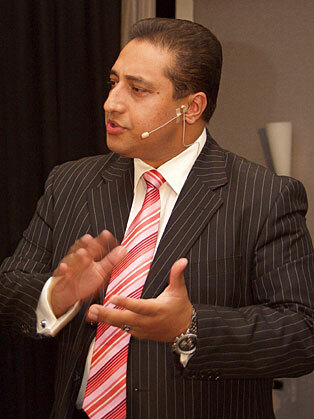 Reg Athwal is a pioneering online television show producer and host of numerous business shows in Dubai and Abu Dhabi. In addition Reg regularly writes articles for the Forbes sister publication 'Your Business' in the Gulf Region and the Market500 publication for CEOs in Europe. He regularly contributes on prime-time shows on Dubai Eye Radio.